Bohol, 28 November 2017 – On the occasion of the 5th anniversary of the ASEAN Human Rights Declaration 2012 (AHRD), the Human Rights Resource Centre (HRRC) joined the ASEAN Intergovernmental Commission on Human Rights (AICHR) and other civil society organisations (CSOs) in consultative relationship with AICHR in a round table discussion on the implementation of the AHRD, the AICHR’s work and the current human rights landscape within the region. H.E. Mr. Leo M. Herrera-Lim, Chairperson and Philippine Representative to AICHR, opened the interface by affirming ASEAN’s commitment to the full implementation of the AHRD to advance the promotion and protection of human rights in the region, in accordance with commitments to international human rights instruments to which ASEAN Member States are parties and regional declarations on human rights. He highlighted that the AHRD, “is envisioned to be the framework for human rights cooperation and consultation between Members States in advancing ASEAN’s aspiration to be a rules-based, people-oriented, and people-centred community.” Towards this end, constructive dialogue between the AICHR, CSOs, and other sectoral bodies is important so that the parties can work together to implement the AHRD more effectively. He expressed hope that the day’s interface will be the first of many discussions for years to come to ensure the human rights of all citizens are promoted and protected. Ensure that the results to AICHR’s regional consultations and dialogues have concrete improvements in the lives of the ASEAN peoples, through: (a) Enhancing transparency and wider participation reviewing the implementation of AHRD and its follow up activities; (b) Support and complement national human rights institutions’ independent reports to treaty bodies, including the Universal Periodic Review, whenever any AMS are under review, with specific focus on the implementation of the AHRD and other relevant ASEAN instrument; and (c) Collaborating with CSOs on specific activities and actions in promoting and protecting human rights. The interface was co-moderated by H.E. Mr. Edmund Bon Tai Soon, Malaysian Representative to AICHR and H.E. Amb. Rosario Manalo, former Philippine representative to AICHR. 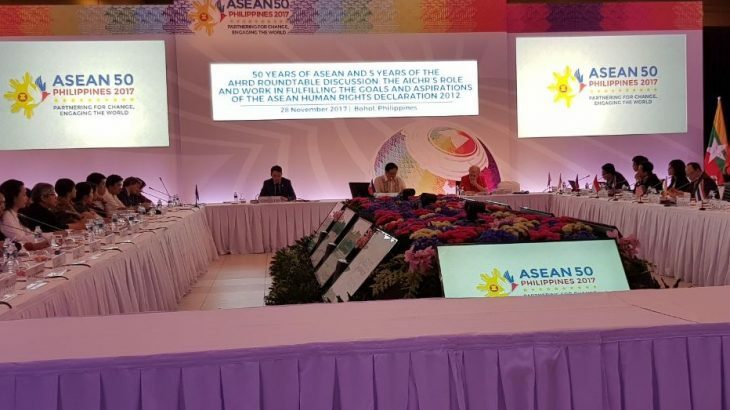 It was organized by AICHR as part of the commemorative activities for the 50th anniversary of ASEAN, with the support of the Regional EU-ASEAN Dialogue Instrument Human Rights Facility (READI-HRF). ACMW, ACWC, AHRD, AICHR, ASEAN, News CSOs, human rights, SDGs. permalink.